Where did January go? My first month as AIR has raced past – possibly due to having my trainers on for Jule’s turbo charged screen printing course! 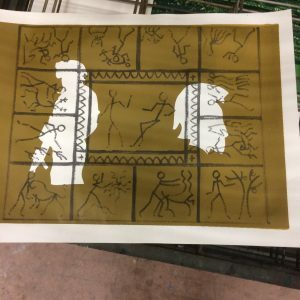 This has been an excellent introduction to the process and mechanics of screen printing with plenty of time for creating our own images. The course is filling a significant gap in my knowledge – hopefully enabling me to better support screen printers in the Open Access sessions. Thanks to Jule and Jeysie who has helped with demonstrations and cleaning up. Here is my first attempt using stencils and an exposure – lots to learn and more practice needed. I feel a bit like a poacher turned gamekeeper for the Open Access sessions. Seeing, and helping with all the work that goes on behind the scenes to keep the studio running has underlined how lucky I was to discover Ochre 3 years ago. I am going to work with a very loose theme for the year – The 12 Labours of Heracles. 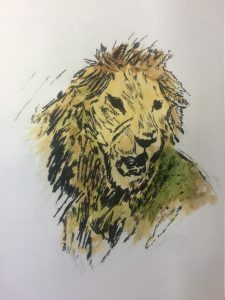 Here is a taster – a drypoint test print of the Nemean Lion (Labour 1).